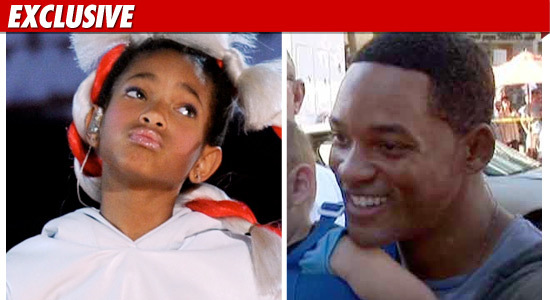 Willow Smith knows her place -- she's a daughter/employee of Will Smith. TMZ has obtained documents filed by Roc Nation, Willow's record label owned by Jay-Z. According to the docs, Roc Nation entered into a recording agreement with Spooky Girl, Inc. "for exclusive recording and entertainment services of Willow Smith." Spooky Girl is Willow's company -- sort of. You see, the Prez of Spooky Girl is Will, and Willow is listed as an "employee." And it gets more interesting, because Jada Pinkett Smith is listed as Willow's guardian. Will can't list himself as a parent or guardian because it conflicts with his duties as president of Spooky Girl. So legally speaking, Jada protects Willow from Will! Contracts involving minors must be filed with the court. But Will and Jada argued in legal docs that the Roc Nation contract contains "highly sensitive and confidential proprietary business and financial information." So the Roc Nation contract was filed under seal, so no one could see how much money Willow is raking in.